20 years after the first online banner ad runs, digital advertising take the largest share of ad spend. Double digit growth to continue in 2014 with forecast 14% increase. 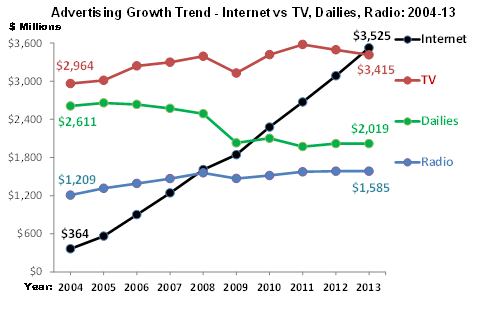 September 17th, 2014 – IAB Canada released the results of its annual internet advertising revenue report. Spending on online advertising in Canada rose to over $3.5 billion in 2013, up 14% compared to $3.1 billion in 2012, exceeding the previous survey’s 2013 forecast of $3.4 billion, a 9% growth prediction. A surge in 2013 mobile ad revenue (+177%) contributed significantly to overall online ad growth in 2013, almost trebling mobile’s share of total Canada internet revenues from 5% up to 13% in 2013. French Canada internet revenue reached $670 million in 2013 and continued to represent 19% of total Canada internet ad revenues. The results of IAB Canada’s Annual Canadian Internet Advertising Revenue Surveys are considered the most accurate measurement of Interactive advertising revenues in Canada. First commissioned in 1998, this marks the 16th consecutive year that Online Revenues are being reported and the 8th consecutive year reporting Mobile revenues. IAB Canada retains Ernst & Young LLP to conduct the revenue studies. Results of individual respondent submissions are held in strict confidence by Ernst & Young and are released in aggregate form only. See the revenue report Appendix for details of the IAB Canada revenue survey methodology, including how net revenues are calculated and the anonymous “double blind” data collection procedure. The Canadian market totals in this report have been cleared for release by the IAB Canada Board of Directors and the IAB Canada Revenue Methodology Committee, the latter body created to recommend and oversee updates to Revenue Survey distribution lists and questionnaire design that reflect evolving industry needs. IAB Canada 2014 – Save the Date! Data Night – A Deep Dive into New Data Models, Talent and A.I.